It’s no secret that sample dresses are an affordable way to increase your bridal store’s inventory without the pricey investment. However when those dress designs are discontinued or turn out to be poor sellers, they can turn into an anchor weighing down your racks and your sales goals. Unloading this dead weight may seem like it takes more effort than it’s worth, but that doesn’t have to be the case. Holding sample sales could be the key to clearing your racks and increasing your profits. Before posting a “SALE” sign in your window, you must first have a realistic business plan in mind for your sample sale. Questions to consider include: Do you want to clear out old merchandise? Increase store traffic? Increase your cash flow? Meet new customers? Whatever the case, Crockett says to be very clear about what you hope to accomplish, then put the tools in place to help you reach that goal. For Alyssa Pung, vice president at Becker’s Bridal in Fowler, Mich., sample sales are all about eliminating inventory. Another consideration is the timing of your sale. For instance, Krysta York, owner of Charlotte’s Weddings & More in Portland, Ore., decided to hold a sample sale in May because it is one of the slower months for new brides. “It’s right before wedding season here in Oregon, so it was great for last-minute weddings to fall weddings,” she says. In addition, York opted to hold her sample sale on a Sunday because her store usually is closed on Sundays, so the sample sale didn’t interfere with her day-to-day business routine. At Bella Sposa Bridal in Denville, N.J., owner Renee Vollmar turns her sample sale into a month-long event. “We do one a year, and it’s ongoing for the whole month of November and concludes with remaining merchandise being further discounted on Small Business Saturday,” Vollmar says. When it comes to sample sales, take the time and effort to segregate the sale dresses from your other inventory so they stand out as something different and unique. At Becker’s Bridal, the store staff moves all sale gowns to the store’s first floor, shifting all other inventory to the second and third floors. “Because the nature of [the sale] is kind of a tornado, we simply utilize our racks like normal, in size order, with large red clearance tags,” Pung says. York adopted a similar approach at her store for the sample sale. “We completely rearranged our store and placed all of the sale gowns by size up on our showroom floor,” she says. Crockett also recommends spotlighting your sample sale in your window displays. “Put one in the front window with a sign that reads, ‘YES! You can afford to wear this lovely gown on your special day,’” she says. Because sample sales are not like your average dress sale, they call for a different way of doing things so the process runs smoothly and you get the best results from your efforts. While there is no right or wrong way to hold a sample sale, there are a few protocols that seem to work best under these circumstances. For example, do not try to schedule traditional bridal appointments. “Our consultants are available for direction to sizes, rooms and general questions, but there are no one-on-one consultations and it is first come, first serve,” Pung says. This keeps shoppers on task rather than lingering about the store without any real intentions of making a purchase. Putting limits on dressing-room items also can keep shoppers on the move. York used scheduling as a way to keep her brides in check. Additional considerations should be made with regard to payment terms, follow-up services and even staff requirements. For instance, during Pung’s sample sales, all sales are final, cash and carry, with no post services on the gowns, she says. And for York, all staff are required to work with no paid commissions. Decide in advance how you plan to handle these aspects of the sample sale, and notify everyone on staff so there are no surprises for either your salespeople or the customers. As with any sale, it’s crucial to advertise your sample sale in order to bring in customers. However, because this is not a run-of-the-mill sale, don’t be afraid to take your advertising to the next level. 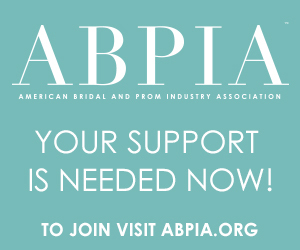 For many bridal retailers, e-mail marketing seems to be the preferred advertising avenue for sample sales. “We sent out multiple e-mail marketing campaigns and that really pushed us,” York says. She also put up some in-store signage announcing the sale. Next year, she says she may include more advertising through social media. To advertise their sample sale, Pung says they invest in an e-mail blast through The Knot while also posting on their website and Facebook page. Regardless of what advertising method you choose, look for unique ways to market your sample sale beyond the traditional “clearance” tag. Also, start advertising your sample sale at least two weeks early so your marketing has time to work, Crockett says. It’s easy to delay when using e-mail and/or social media to promote your sale, but it’s important to provide enough time for customers to put the sale on their calendar as well as to spread the word to friends and family who may be shopping for a wedding dress. Selling off sample dresses is something every bridal retailer has to deal with on a regular basis, so sample sales offer what appears to be a quick and easy way to unload your unwanted inventory. However, with the right showcasing, sales guidelines and advertising, you can turn this effort at quick cash into an opportunity to create a fun event that future brides will seek out for years to come. Is An Outlet Right For You? 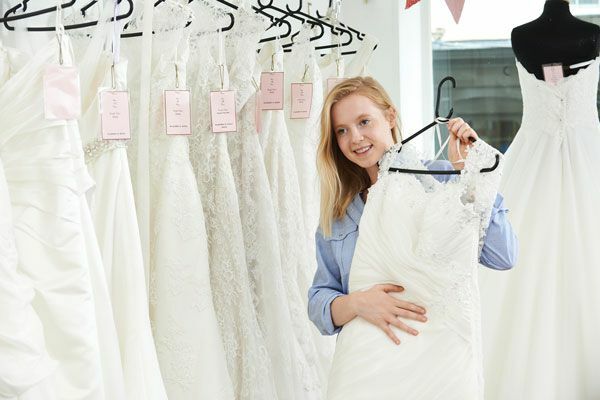 Some bridal retailers offload their sample dresses to an offshoot of their existing store. This offshoot, or outlet store, operates as a clearinghouse for discontinued dresses, sample dresses, even accessories like shoes and jewelry that no longer sell or have been replaced with the newest trends. However, an outlet store may not be a realistic solution for every bridal retailer. Consider the following questions before opening your “outlet” doors. Does an outlet store fit in with your main store’s brand and reputation? After careful consideration, Alyssa Pung, vice president of Becker’s Bridal in Fowler, Mich., decided against setting up an in-store outlet because of the adverse effects it could have on the main store. “We were afraid it would lower regular-priced gown sales and also set a different tone than we would like for our brand,” she says. Instead, she opted to have an online “outlet” on her store website where shoppers could find discounted dresses. If an outlet does align with your regular retail store, treat the outlet as an equal, not an afterthought. Do you have adequate floor space to accommodate an “outlet” store? 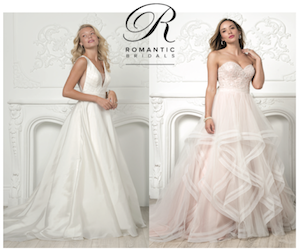 At Collezione Fortuna Bridals in Carmel-by-the-Sea, Calif., owner Cathy Montante didn’t want to give up valuable sales space for discounted dresses. For those who do have the space, make sure your outlet matches the same look and tone as the rest of your store. Do you have enough inventory to properly stock an outlet store? Empty racks and shelves are a big turnoff for shoppers, so you want to make sure you have enough product to stock an outlet store. If you will not be able to restock merchandise on a regular basis, a special clearance section may be the better way to go for your store. Do you have the funds to staff, operate and market an outlet store? Even with a large amount of available merchandise, making money on sample or discontinued dresses, off-trend shoes and other accessories headed to the outlet department could prove challenging. It’s important to examine if the additional funds you’ll have to direct to an outlet for labor, overhead and marketing are worth the payoff.